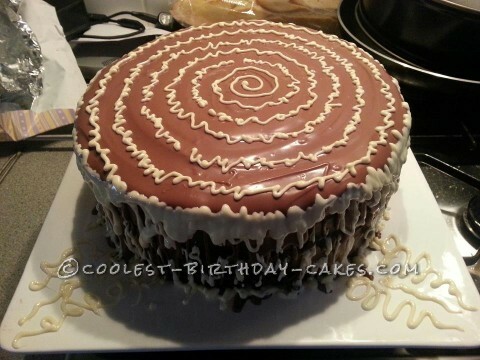 Well, I actually made this disgustingly Chocolatey Brownie feast cake for my 30th birthday earlier in the year (2012). I decided to have a party at my parents house as it was the summer time here in the UK so an outdoor party was planned in the gardens. All my friends know that I like to bake when I have spare time and they all have a soft spot for my chocolate brownies. Two of my friends had been asking me if I would be making my own cake this year as it was a special occasion. At first I said no because I normally make cakes for other people and it would be nice to have one made for me. However, after a few weeks of gentle encouragement from my friends I finally gave in and said yes. One friend asked for some of my brownies for the party so I thought I would make a brownie cake instead. Well, I couldn’t just make any old brownies on a plate, I wanted something special, so I set off making my creation! Five 12 inch diameter layers of chewy chocolate brownie sandwiched together with a sweet whipped chocolate fudge butter cream. The whole thing lovingly smothered in around 600 grams of white tempered milk chocolate and drizzled with white chocolate. Now believe me this was not for the feint hearted at all as this is was a seriously chocolaty cake. In all the cake was fairly easy to make and I managed to get it done in between dealing with other tasks around the house. The cake actually went down a storm at the party….. so quickly in fact that I didn’t get to taste it after blowing out the candles, as by the time I came back to the cake, it had all gone.